Southern Resident killer whales are a sub-species of Orcinus orca. They’re called ‘residents” because they reside in the Salish Sea and surrounding basin from spring through fall where they forage for food. During winter they travel further afield to find food. Unlike other North Pacific killer whale ecotypes which feed primarily on marine mammals, the Southern Residents’ diet consists solely of fish. Chinook (King) salmon makes up 80% of their diet, while other fish species make up the remaining 20%. There are three Southern Resident pods named J, K and L pods. They are matriarchal groups led by older females. The older females are usually the ones who lead their pods to salmon hotspots to forage. Typically, both male and female offspring remain with their mothers for life. 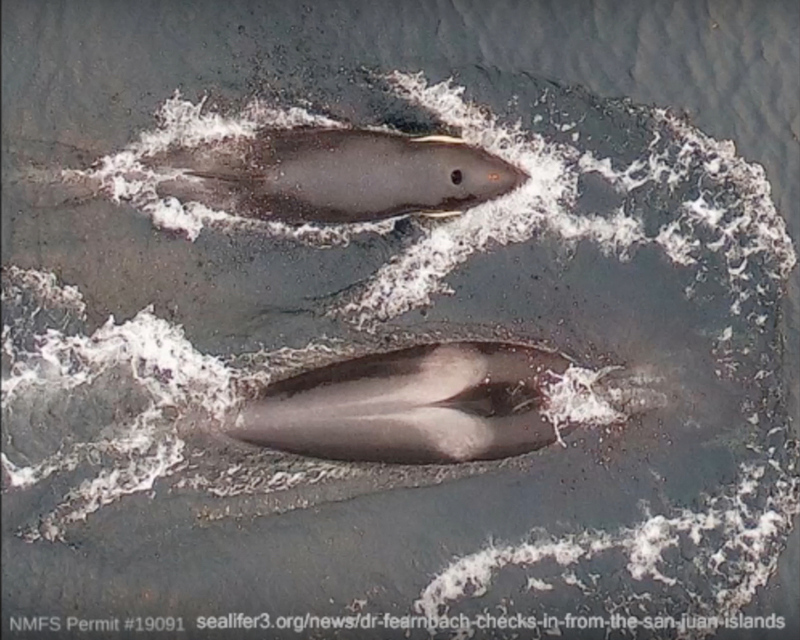 Females do breed with males from other pods but always return to their original pod to raise their calves. There are rare cases where a male has left his original pod to join another. The Southern Residents are highly intelligent, social animals. They have pod-specific dialects of calls, whistles and clicks that they use to communicate, hunt and keep the group together. Calls can travel 10 or more miles under water but these calls can be interrupted by anthropogenic noise. The three Southern Resident pods share about 30 common calls that they use to communicate within and across pods. They also have pod-specific calls. Southern Residents were listed in the United States as endangered in 2005 under the Endangered Species Act and a recovery plan was completed by NOAA in 2008. Although 10 years have passed since the recovery plan was created, the population of Southern Residents has continued to decline. As of January 10, 2019, only 75 whales remain. One is newborn calf L124 born to L77. According to the Center for Whale Research, 75% of pregnancies in the last two decades have failed. No surviving calves have been born since 2015. The latest failed pregnancy has received worldwide attention as the mother, J35 (Tahlequah), has carried her dead calf in a “tour of grief” for over 10 days. We hope this calf will survive to maturity, beating the odds. Unfortunately, two other whales, adult female J17 and adult male K25 are showing signs of severe malnutrition. It is estimated by the Center for Whale Research that the existing population has approximately 5 more years of reproductive viability. The top threat to Southern Resident killer whales is malnutrition due to limitation of supply of their primary food source, Chinook (King) salmon. Chinook salmon are highly endangered, estimated to be at 1- 5% of their historical population level. The top causes of the decimation of Chinook salmon populations are dams blocking access to critical spawning habitat, overfishing, and open-net fish farms located along wild salmon migration routes exposing them to waste, chemicals, disease and parasites. Predation by marine mammals is not considered by leading scientists to be a significant threat to Chinook salmon. Another important threat is anthropogenic noise and disturbance reducing foraging efficiency. Noise from vessels can interfere with the echolocation abilities of Southern Residents as they search for food. The speed of motor-powered boats is the main factor in how much noise the whales experience. Due to this noise, the whales feed less when boats are nearby and spend more time traveling. The third top threat to the population is the high level of stored contaminants in their blubber. The pollutants include pesticides (including DDT), industrial coolants and lubricants (PCBs), flame retardants (PBDEs), motor oil, and chemicals from other household products that enter Puget Sound and the Pacific Ocean when it rains, contaminating the fish populations. Southern Residents accumulate pollutants from the fish they eat in their blubber. This can compromise their immunity and reproductive success, leaving them more vulnerable to disease and making it tougher for them to rebuild their numbers. On March 14, 2018, Washington Governor Jay Inslee signed an executive order directing 7 agencies to boost orca recovery with a wide range of actions, and creating a special task force to track progress and define long term strategies. Stephanie Solien, vice chair of the Puget Sound Partnership Leadership Council, co-chairs the task force along with Thomas (Les) Purce, formerly president of Evergreen State College and mayor of Pocatello, Idaho. The Governor invited Task Force participation from members of the legislature; the Government of Canada; Washington Department of Fish and Wildlife; representatives from tribal, federal, local and other state governments; the private sector; and the non-profit sector. You can access more information about the task force members meeting schedule here. The task force to provided its Year 1 Report and Recommendations to Governor Inslee on November 16, 2018. The report contains a list of 36 proposed actions aimed at reducing threats to the endangered Southern Resident killer whales by increasing Chinook salmon abundance, decreasing disturbance from vessels and noise, and reducing the exposure of killer whales and their prey to chemical contaminants. A follow up report of progress with lessons learned and additional needs is due October 1, 2019. Leading Southern Resident killer whale scientists and experts are concerned that the task force recommendations will be insufficient to ensure recovery of the wild Chinook salmon population in critical Southern Resident foraging areas. Multiple non-profit organizations are asking constituents to urge the Governor and State Senators to commit to breaching the 4 lower Snake River dams in 2019 in order to enable significant Chinook recovery within the estimated 5 years of remaining reproductive viability of the existing Southern Resident population. Breaching the dams is is envisioned as a critical part of a combination of actions necessary to increase Chinook by 15% and reduce anthropogenic noise and disturbance by 50%. For more information about the rationale for breaching the four lower Snake River dams, visit Dam Sense, Center for Whale Research, NRDC, and Save Our Salmon. 1. Don’t consume Chinook (King) salmon sourced from British Columbia, Washington or Oregon. Nicknames for Chinook salmon include King, Spring, Tyee, Columbia River, Hookbill, and Black and Blackmouth. 2. Our friends at Orca Salmon Alliance have pulled together a list of things you can do to reduce threats to killer whales. We encourage you adopt as many of these practices as you can. 3. Check this page periodically for new petitions to sign on behalf of conservation of the Southern resident killer whales. Thank you for taking action to support Southern Resident killer whales.